8 AM Working party of 52 men detailed for unloading Lorries etc. 9 AM Working party of 53 men detailed for errecting huts. 3 PM Working party of 108 men detailed for unloading ammunition. 6 PM Working party of 128 men detailed for unloading ammunition. 8 AM Working party of 21 men detailed for work errecting huts etc. 8.30 AM Working party of 119 men detailed for hauling material and errecting huts. PM Working party of 122 men detailed for unloading ammunition etc. 8 AM Working party of 108 men detailed for work errecting huts and hauling material. 10 AM Bayonet Fighting Instruction – all recent drafts. 3 PM Working party of 125 men detailed for unloading ammunition. 6 PM Working party of 137 men detailed for unloading ammunition. 6 AM Weather very cold – snow. 8 AM Working party of 50 men detailed for work errecting huts etc. 8.30 AM Working party of 100 men detailed for unloading ammunition etc. 6.30 PM Working party of 125 men detailed for unloading ammunition etc. 6 AM Weather fine – cold – some snow. 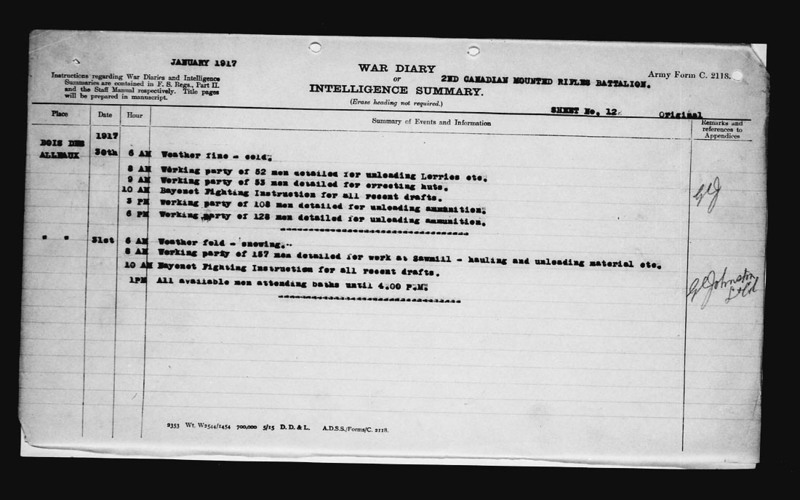 8.30 Working party of 156 men detailed for work unloading ammunition etc. 9.00 Working party of 28 men detailed for work errecting huts etc. 10 AM Bayonet Fighting Instruction for allrecent drafts. 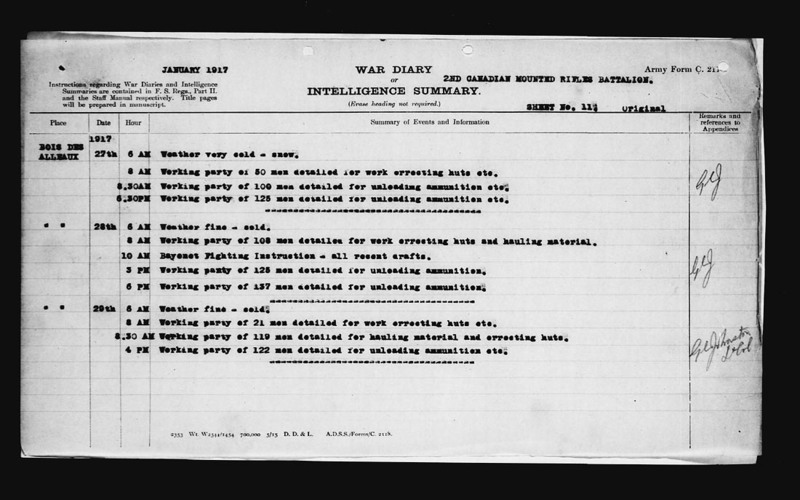 3 PM Working party of 100 men detailed for work un-loading ammunition etc. 6 AM Weather cold – fine. 8.30 AM Working party of 72 men detailed for work errecting huts etc. 10 AM “B” and “C” Companies paraded for Commanding Officers inspection. 6 AM Weather cold – snowing. 8.30 AM Working party of 66 men detailed for work errecting huts etc. 9 AM Rifle and Kit inspection held by all companies and details. 2 PM Box Respirator drill held. 2 PM “A” and “D” Companies paraded for Commanding Officer’s Inspection. 3 PM Recent drafts paraded to Gas Huts – ECOIVRES – for issue of new box respirator. Tue., Jan 23, 1917 A.28b.7.8. 6 AM Weather fine – very cold. 10 AM Situation quiet – Wind North East. 11.30 AM Relief commenced with 1st C.M.R. Battalion. 4 PM Relief completed – no casualties. 5 PM Headquarters established at Bois Des Alleaux. 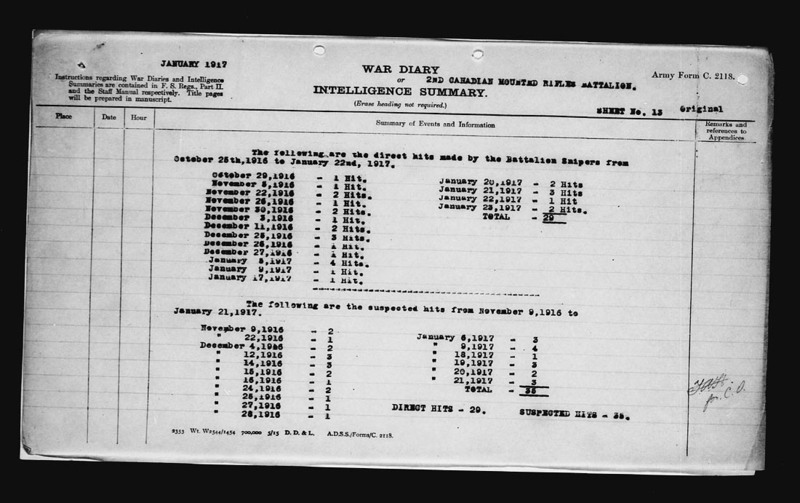 Mon., Jan 22, 1917 A.28b.7.8. 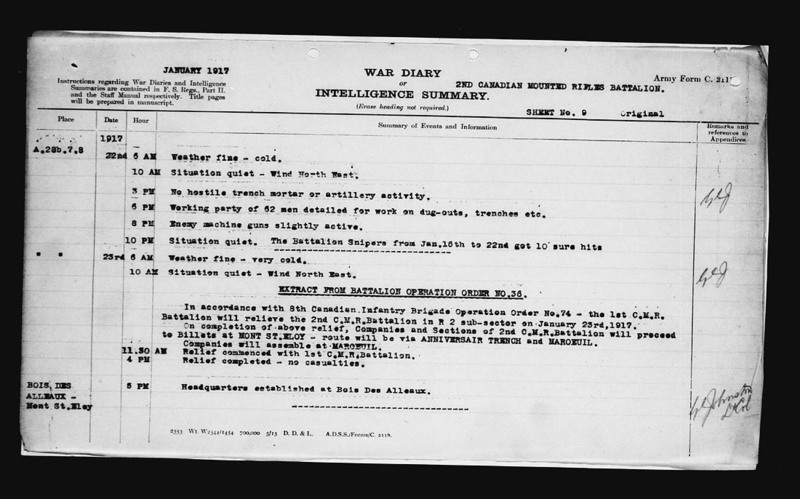 3 PM No hostile trench mortar or artillery activity. 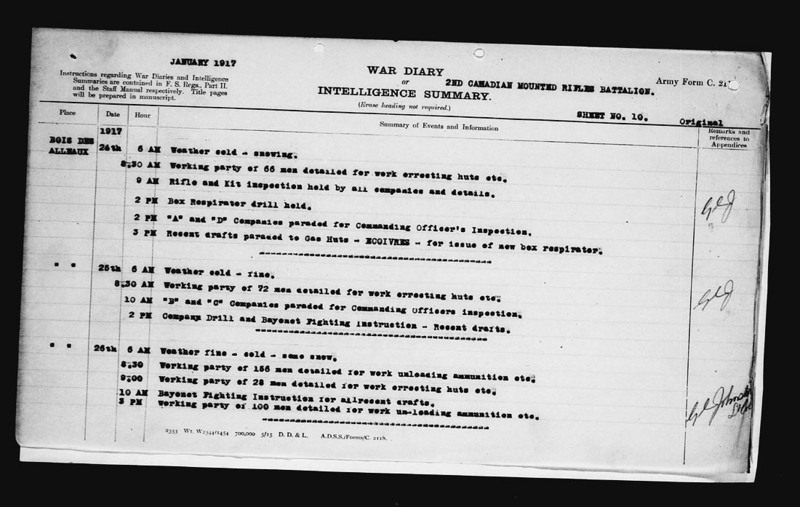 6 PM Working party of 62 men detailed for work on dug-outs, trenches etc. 8 PM Enemy machine guns slightly active.